The wait continues for Tiger Woods’ comeback. Saying that his game was “vulnerable,” Woods confirmed Monday that he will withdraw from the Safeway Open, three days before the start of the event. The stunning news comes just three days after Woods committed to play in the season-opening event, and the PGA Tour trumpeted his return in a press release. There was no mention of the Safeway commitment on his website, other than the initial post from Sept. 7, when he said that he “hoped” to play three events this fall. Also on Woods’ upcoming schedule was the Nov. 3-6 Turkish Airlines Open and the Dec. 1-4 Hero World Challenge. After canceling the trip to Turkey, he said that he “plans” to play in his tournament in the Bahamas. Speaking earlier Monday on Golf Channel, Notah Begay III said that Woods had “some concerns about the sharpness of his game” after sitting out the past 14 months. Two weeks ago, Woods served as a vice captain for the U.S. Ryder Cup team. Players tempted him to hit a few shots at Hazeltine, but Woods declined. He practiced the past week in California, including at Stanford over the weekend, but didn’t see enough progress to head to Napa. On Monday, he took part in a pro-am event on the Monterey Peninsula that benefits his foundation. “He just didn’t feel like his game is where he wanted it to be to be competitive,” Begay said. 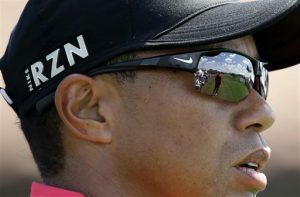 The 11th-hour withdrawal is a crushing blow for tournament officials, whose ticket sales have doubled over last year (a spike of nearly 30,000 tickets) after Woods initially stated his intention to play. Woods was reportedly set to play the pro-am with NBA star Steph Curry, then play alongside Phil Mickelson for the first two rounds at Silverado. Johnny Miller, tournament host of the Safeway Open, said that the news was very disappointing given the amount of attention his tournament has received over the past two months. Woods, now ranked 786th in the world, has not played anywhere since Aug. 23, 2015, when he tied for 10th at the Wyndham Championship. Since then, he has undergone two back surgeries (his third in the past 20 months). It was the first time in his career that he has missed all four majors in a year.